The magnificent Gothic Victorian buildings in Mumbai's Fort Area highlight the power and wealth of the British Empire at its might. They are reminiscent of many of the great public buildings in London or Glasgow. 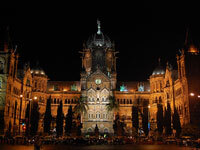 The Victoria Terminus (known as CST) was opened in 1888, and is one of the world's grandest railway stations, on a par with New York's Grand Central Station or London's St Pancras. Built in the Italian Gothic style, it looks more like a lavishly-decorated cathedral than a railway station: massive arches soar splendidly above the scurrying crowd, and carved into the pillars and buttresses are images of monkeys, peacocks, elephants and lions. The station is topped by a tall dome crowned with a statue representing Progress. The nearby St Thomas' Cathedral was built between 1672 and 1718, standing witness to almost the entire history of the British in Bombay. Its whitewashed interior contains poignant colonial memorials - including one to Henry Robertson Bower, Lieutenant of the Royal Indian Marine, who lost his life returning from the South Pole with Captain Scott. The epicentre of the Fort Area is Horniman Circle, which is surrounded by curved, arcaded terraces. The lush and leafy garden in the centre offers a welcome retreat from the hustle and bustle of the surrounding city.